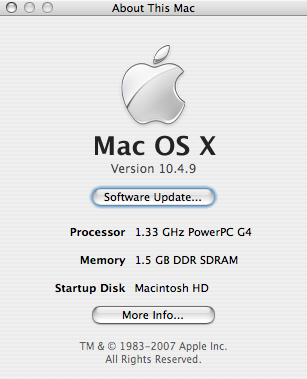 I just upgraded my iBook to 1.5GB, the most it’ll take. The CD·ROM Store took a bit of time to get the memory in, but when they did it was $50 less than I was originally quoted. appeared to work, but no extra RAM recognized. black screen – double eek! Seems I spoke too soon – it just crashed magnificently. On your install disk – they grey one that comes with the machine, there is a RAM test feature in the hardware tests – run that to see if there is anything wrong with the ram.